Earlier this week we went from freezing morning temperatures to a more mild start to the day. I think it was on Wednesday morning when I noticed the sound of birds singing all around during my walk with Tasha. It sounded, and felt, like a nice spring morning. By contrast, frozen mornings are silent; only the occasional caw of a crow can be heard. 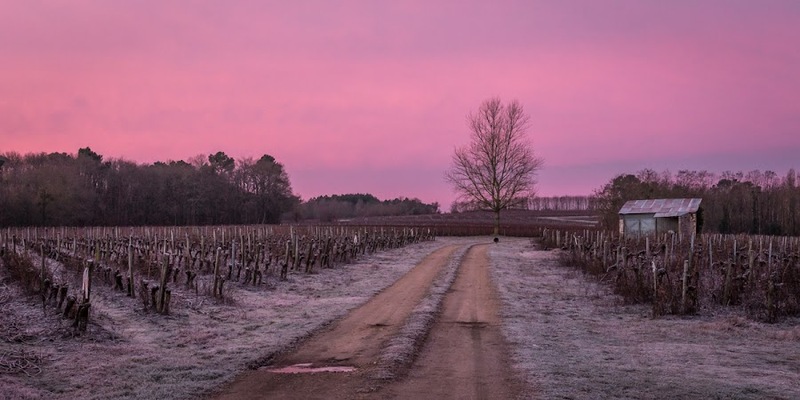 A pink sunrise on a frosty morning earlier this week. So, I guess the transition from winter to spring is under way, even though we're still about six weeks from the equinox. That is not to say we won't have more cold weather, or even snow. February is famous for snow around here, at least that's been my experience. Last February is a good example. I see a lot of sunset and sunrise photos at fellow bloggers sites, but this one is pretty special. There is a great calmness about the sky. Another breathtaking view and photo. Perfection! There's a line by Samuel Beckett that fits that picture - "beaux jours, gris de givre"
I think Spring needs a while to "birth" where the other seasons seem to announce themselves full-blown. At least around here that seems to be the way. This is the Seattle area and right now there is a warning of a bigger snow coming - Costco on a Thursday had loooooong checkout lines. But we can also have a few days of being able to wear shorts for an hour or two in the middle of the day - maybe just a teaser? That sky is awesome!